Last week at this time I was at a much higher elevation, both geographically and intellectually. Not to go all whoo-whoo on you, but I’ve long believed that people and events come into our lives at precisely the right moments. Sometimes those intersections look way more like crap floating down the river of our lives than butterflies in our meadows, but those intersections between people, events, and places are usually more than they originally appear. On my way back through one of the nation’s high places, I stopped for lunch in Frisco, Colorado. And while I was unable to find a fully gluten-free lunch, I did manage to find food, more coffee, and this little thing. I’ve decided it makes a fine talisman. After all, who doesn’t need to be reminded to be fearless? I rather like the combined effects of this bit of shiny. First off, it’s a puzzle piece. 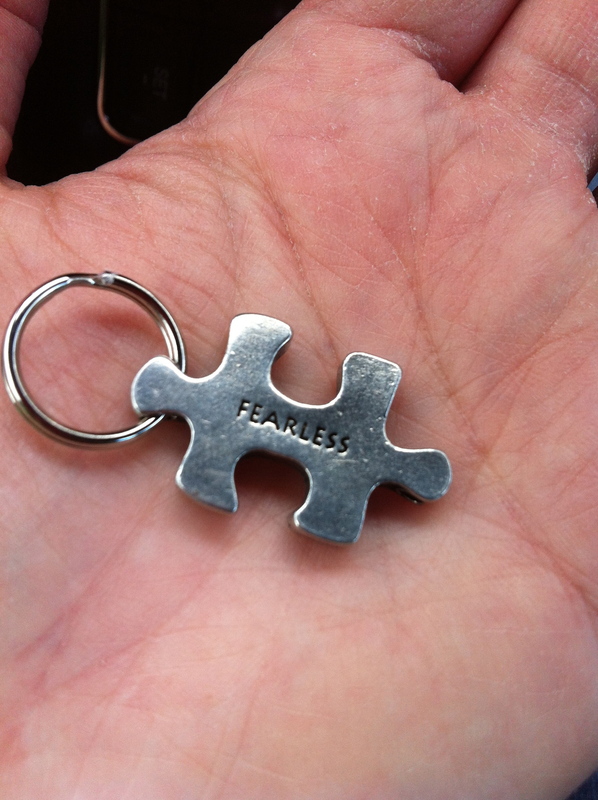 Secondly, one side is engraved with “I am” and the other with “Fearless”. When I spied it, it was like one of those hokey ray of sunshine Hallmark card moments. Like the proverbial powers that be were reminding me that if I want to figure out this puzzler of life, then I’d better find out what I’m made of and then figure out how to be a bit more fearless. I’d like to think that the fact I was even there on a road I’d never before travelled was a nod to my ability to be a bit more fearless. But the fact is I am not good at being fearless. Heck, some days I barely manage the “I am” aspect of the equation. All those crap-moments that have floated down my stream over the years has created a fearful little ole me. And how crappy is that? Do you remember when you turned fearful? Was it a person or an event or just a whole lotta crap coming down the river at you? For me, the answer is Yes. And, of course, the ultimate answer is me. Because in order to become fearless, I must remember that I am. After two flights which made me mildly panicked, I arrived home. And I’m still buried in all the stuff I normally do everyday but which didn’t happen while I was gone. You know, like the two loads of laundry that have to happen everyday. That kind of stuff. The stuff that is only important when you realize there are no clean undies in your drawer or the hardwood floor becomes fuzzy. The best thing about my trip to a writer’s retreat was not just the camaraderie or the locale. It was being refueled with the ability to write. I think most of us writerly types get to a spot in our stories where the words might be there, but the way to align them is gone. Or perhaps the way is there, but we cannot see it due to the dust and life-debris obscuring our view. Being with other writers was like being handed a map through the chaos. It also reminded me that the way to fix this novel is the same as cleaning my house: set the timer, work like a mad woman, and move on. It may take more rotations than I want, but eventually I’ll get it cleaned up until it’s ready to be shared with others. Amazing how a different pair of eyes can see what we so easily overlook. So I’m back home, doing the dishes and the laundry, and the writing. My house and my novel are both heading in the right direction…tidy enough to be shared. The house cleaning and the words are never really done, because the living in them happens. Both are messy, requiring effort and time and the reminder to fearlessly share the results. This entry was posted in Front Page, Writing and tagged cleaning house, talisman, writing by kristina. Bookmark the permalink. Settling in after my weekend conference, I felt the same sense of overload. I completely hear you about the things we usually do not being done. It’s taken me a week to get mostly, sort-of caught up.